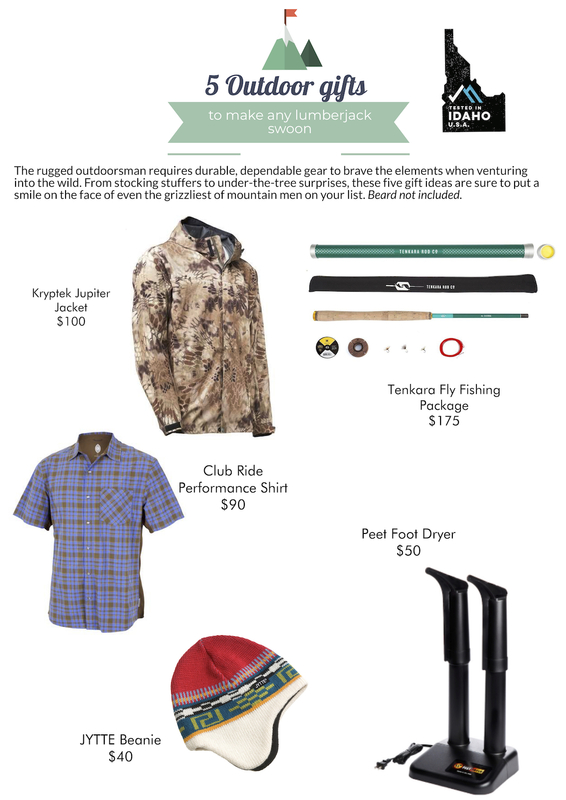 Holiday shopping for the active, nature-loving gear junkies in your family can be challenging. That’s why we’ve rounded up our favorite Idaho-based gift ideas — from stocking stuffers to under-the-tree surprises — for the lumberjacks and Jills, of all ages, on your gift list. The rugged outdoorsman requires durable, dependable gear to brave the elements when venturing into the wild. Put a smile on the face of even the grizzliest of mountain men with one of these five gift ideas. Beard not included. Show your true stripes with the JYTTE (pronounced you-tay) Beanie. Made from 100% merino wool with a 100% polyester micro-fleece inner band, this colorful beanie keeps your head warm on cool days whether you’re hitting the slopes or just out on the town. The Beanie is available in scull or tassel style and comes in five fun color options. You tay you’re chilly; We tay you need a beanie. If the great outdoors is your playground, then you know soggy boots and shoes can and will happen, but they don’t have to keep you from enjoying the next day’s excursion. The PEET Dryer circulates warm air through your footwear to remove water, sweat and odor, leaving them dry and ready to go for tomorrow’s adventure. Trust us, your feet will thank you. Mountain bikers, this will soon be your favorite jersey. Blending the western-inspired style of plaid and snap buttons with trail-tested technical features like moisture-wicking material, mesh venting and a zippered rear pocket, the Detour is lightweight and extremely comfortable. Whether you’re commuting to work, cruising down singletrack or meeting up for drinks and dinner afterward, the Detour’s versatility will keep you feeling and looking cool anywhere. For backpackers and hikers looking for a lightweight, agile fly rod kit for small to midsize waterways, this is it. At 2.8 ounces and extending from 20 inches to 10.5 feet, the Sierra offers uncanny flex and feel, perfect for landing a fly in creeks, streams and tight spaces. The package includes rod, rod tube, rod sock, 10.5-foot hand-furled Tenkara line, 3 flies, wood line holder, tippet and a lifetime warranty. Hunters need to be prepared for unexpected weather when they’re stalking game. That’s why Kryptek’s waterproof Jupiter Jacket should be on every huntsman’s gear list. This breathable, lightweight jacket keeps you dry when a surprise shower threatens to soak you to the bone. It even stuffs into its own pocket, making it easy to throw in or strap to your pack so it’s always within arm’s reach. It’s not just the guys who get to claim the title of gearhead. Female adventurers can be just as selective when it comes to their gear. 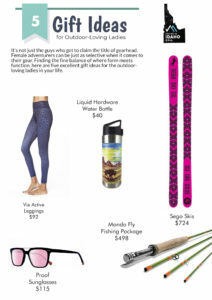 Finding the fine balance of where form meets function, here are five excellent gift ideas for the outdoor-loving ladies in your life. With a navy-leopard print that would even make Catwoman purr, these leggings are as stylish as they are comfortable. The flattering design creates slim lines and elongates your legs, while the stomach-flattening waistband keeps you sleek and supported through even the toughest workout. Plus, they’re made of quick-drying, odor-resistant fabric so you can go straight from running, squatting, dancing or down-dogging to brunching with the ladies, no sweat. Ladies looking for a progressive, all-mountain ski: We’ve found your match! Whether you’re zipper-lining through mogul fields, lapping the park, weaving through tight trees or holding an edge while making turns on firm slopes, the UP 92s can do it all with ease. Designed by professional skier Lynsey Dyer, these women’s skis provide plenty of pop in a durable, lightweight package. Show your style any time of the day with these fashion-forward frames featuring tinted lenses that can be worn outside and in. The 45th Parallel is a mix of a classic trapezoidal shape and a modern, sleek body, capped with a stainless-steel bar across the brow for a unique look. Plus, they come with a wood storage box and microfiber pouch for protecting and cleaning your frames. Note: These are a limited edition, so don’t miss out! If you’re a fan of having ice-cold or steaming-hot beverages with you while skiing, snowshoeing, hiking or any outdoor activity, then this buffalo-clad bottle is for you. Featuring amazing artwork by Jackson Hole artist Abby Paffrath, the Totanka Sidewinder bottle is made of vacuum-insulated stainless steel, so you never have to worry about taking another sip of a lukewarm beverage. Plus, it comes with a magnetic lid that conveniently sticks to the bottle, so you can take a one-handed swig without fear of dropping or losing the lid. 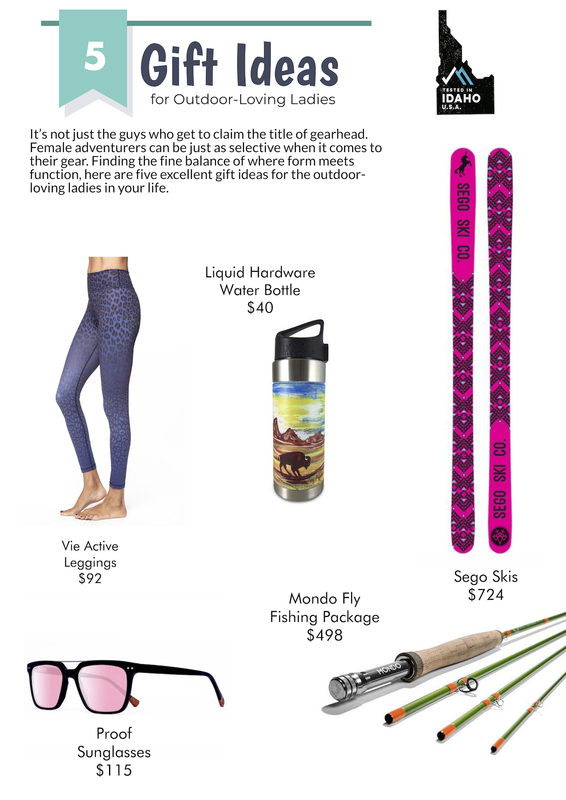 Fusing custom art and bright colors with high-performing gear at a reasonable price, Mondo’s mission is to make fly fishing approachable for everyone. That’s why they’ve bundled everything you need to get out on the water into one amazing package. Starting with the Green Glow and Fire Orange rod (which we love), you get to pick your reel design and line color from a variety of vivid designs and colors, respectively. Whether you’re hitting inner city ponds and canals or going knee-deep in raging waters you’ll having everything you need to hook a big one. There’s nothing more special than experiencing the great outdoors with your children. 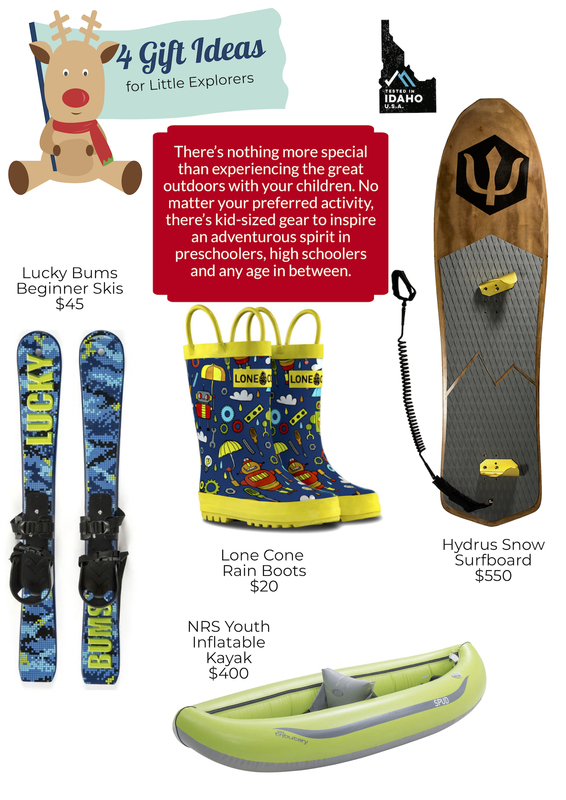 No matter your preferred activity, there’s kid-sized gear to inspire an adventurous spirit in preschoolers, high schoolers and any age in between. Here are four great gift ideas for the young explorer on your list. Keep your little adventurer’s feet dry and stylish with these durable, easy-on rain boots. Made from 100% waterproof, BPA-free rubber, these comfortable, breathable boots have a non-slip tread, so kids can run, jump and skip through puddles without feeling stiff and constrained. Best of all: they come in an array of playful designs adored by boys and girls alike. Warning: Your child will love these so much, they won’t want to take them off! Get your little one ready for the slopes! Made for toddlers four and under, these beginner skis strap to children’s snow boots so they can get used to stomping, sliding and duckwalking in snow. Kids can focus on moving, playing and having fun in the backyard or on gentle slopes without the fear of losing control, so they’re confident in skis when the real lessons begin. Looking for the perfect boat to introduce kids to whitewater? Then look no further. Short, lightweight and super stable, this inflatable kayak gives kids the confidence to charge rapids, punch holes and cross eddy lines right alongside you. With wider dimensions, even adults can take it for a ride — if your kiddo says it’s OK, that is. Shredding fresh pow has never been more fun! Combining a wide, surfboard shape with snowboard-style side cuts, the Teton Powder Surfer is built for floating on and making incredibly smooth turns in fresh, deep powder. Unlike anything you’ve ridden before, the board’s size makes it great for riders of nearly all skill levels and sizes. We love that you have the option of riding it with or without bindings, which makes it perfect for backcountry adventures. Comes with traction pad, boot clips, mounting hardware and a 9-foot coil surf leash.